As the school summer holidays come to an end, here in Australia, my focus is switching from lazy days at the beach to filling my freezer with lunchbox friendly goodies. These Savoury Muffins are my newest recipe and perfect for the lunchbox. Packed with four different vegetables they are easy to adapt. 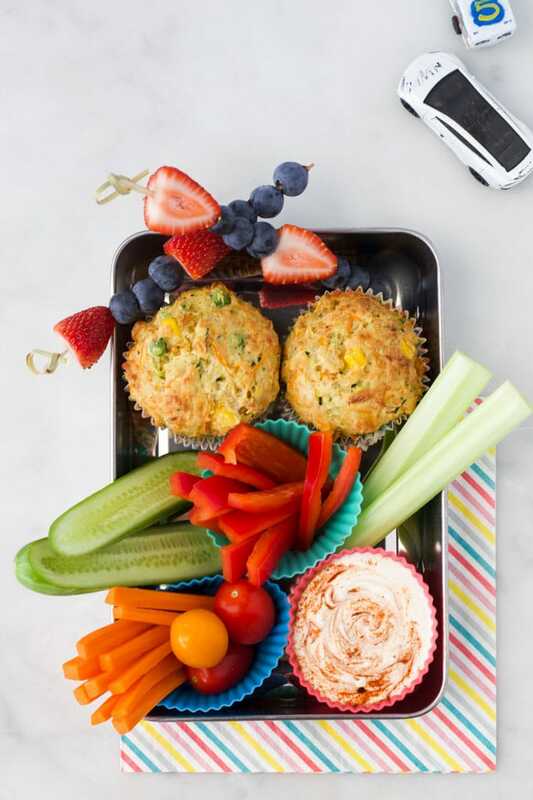 Use the same base recipe but customise you own vegetable muffins to suit your child’s taste. Most of my lunchbox ideas are actually foods that I used to make my youngest when he was a baby. I weaned him using the baby-led weaning method and was always looking for great finger foods that I could take out and about with me. Some of my favourites were Sweet and Sour Quinoa Balls, Curried Lentil Bake, Egg Rolls and Mini Blender Muffins. 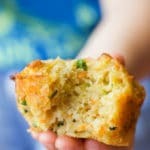 These Savoury Muffins would have been great for when I was doing baby-led weaning. To reduce the sodium level you can add less cheese to the mixture. The cheese is there for flavour only. 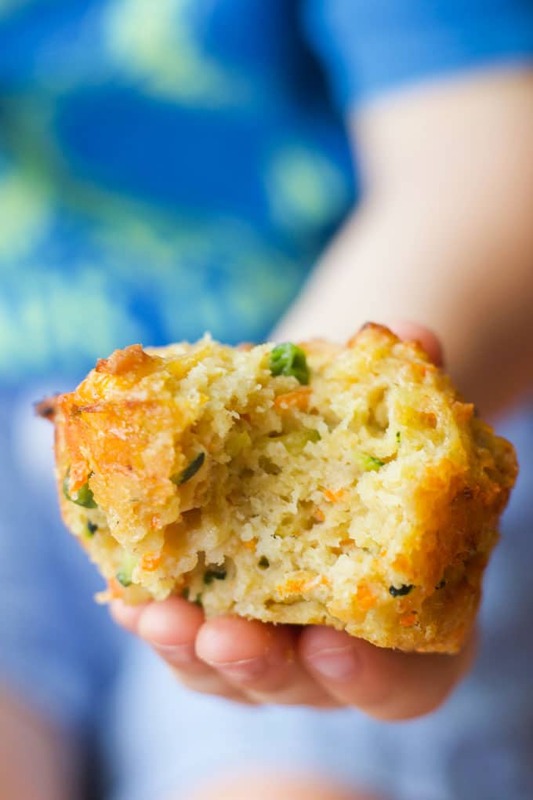 Of course, these vegetable muffins are not just limited to baby-led weaning and the lunchbox. They make a great breakfast, lunch or snack for both adults and kids. Here are my tips to help make light, fluffy and delicious vegetable muffins. 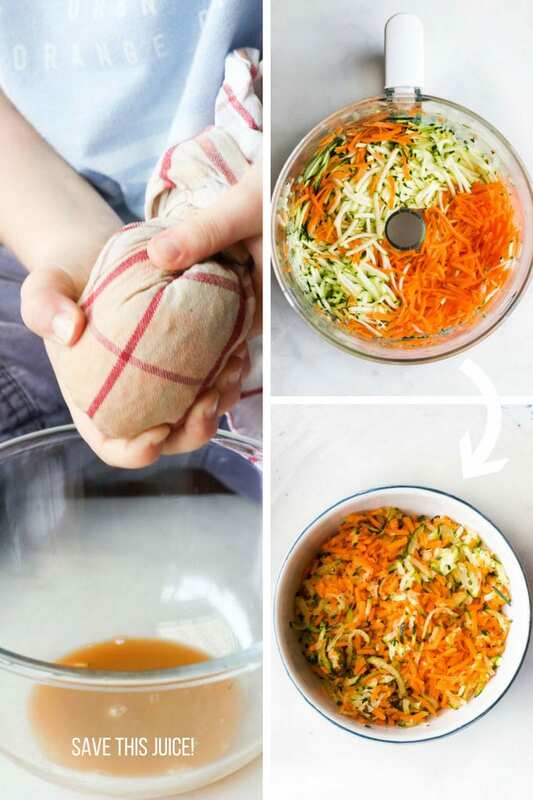 Ensure to squeeze out the juice from the grated carrots and zucchini. I do this by placing the grated vegetables onto a clean tea towel and squeezing it as hard as I can! I have made these muffins without doing this and they were a little too wet inside. NOTE: Save the juice and use it in smoothies or sauces. – don’t throw away all that goodness! Don’t over stir the mixture. Resist the temptation to over stir or beat the batter, it will cause your muffin to go tough. You want the final mixture to be lumpy, thick and looking very messy. (see below) It should only take around 10 strokes with your wooden spoon. Don’t skimp on the veggies. If your child doesn’t like one of the vegetables, don’t just leave it out. Add extra of the other vegetables or replace it with a different one. These muffins are so much better with a bit of veggie in every bite. Grease the muffin pan really well before adding the batter. I have baked these with muffin cases and without. I got better results without cases. Often I found the muffins stuck to the cases but if you use a non stick pan and grease it well the muffins are easy to remove. If you do prefer to use the paper muffin cups, I would recommend greasing them with oil spray before putting the batter in. Alternatively you could try the silicon muffin cases. Keep an eye on the baking time. Take the muffins out of the oven too soon and they will be sticky and uncooked. Bake them too long, and you run the risk of dry muffins. Every oven is different, so while you should still follow the bake time in this recipe, use a skewer to test your muffins a couple minutes before the end of the bake time. Your skewer will come out clean if they are ready. Let your muffins cool completely on a wire rack. Before storing your muffins, it is important to allow them to properly cool. Allow your savoury muffins to cool in the muffin tray for around 5-7 minutes. If you leave them in the pan too long they run the risk of going soggy, you just want them to be firm enough to transfer to a wire rack. Once on the cooling rack the muffins should be left to cool completely before storing. Storing the muffins when they are even a little bit warm will result in condensation and soggy muffins. My favourite way to store savoury muffins is to freeze them, and if properly frozen they will be good for around 2-3 months (but will remain safe to eat well past that). To ensure best quality, individually wrap the muffins in clingfilm or foil and then transfer to ziplock bags or freezer containers. To reheat – just pop them out of the freezer and place them back in the muffin tin. Reheat at 170c /350f until heated through. Alternatively, allow them to thaw and then reheat them in the microwave. You can refrigerate muffins, but it isn’t recommend. Refrigeration temperatures alters the texture of the muffin and can make them go stale quicker. Storing at room temperature is better than refrigeration when it comes to muffin quality. The best way to store them is to line a air tight container with kitchen paper, pop the muffins on-top and then another layer of kitchen paper, before adding the lid. The paper absorbs the moisture from the muffins, stopping them from going soggy. It is hot and humid here, at the moment, so I only store the muffins at room temperature the day I bake them, the rest I always freeze. Normally muffins would last a couple of days at room temperature. However, as I haven’t tested these, I can’t say for sure how they would last. Finely chopped and lightly fried onion, shallots, mushroom, celery or leek. I’d love to know what variations you try, please do comment below or tag me on Instagram or Facebook. 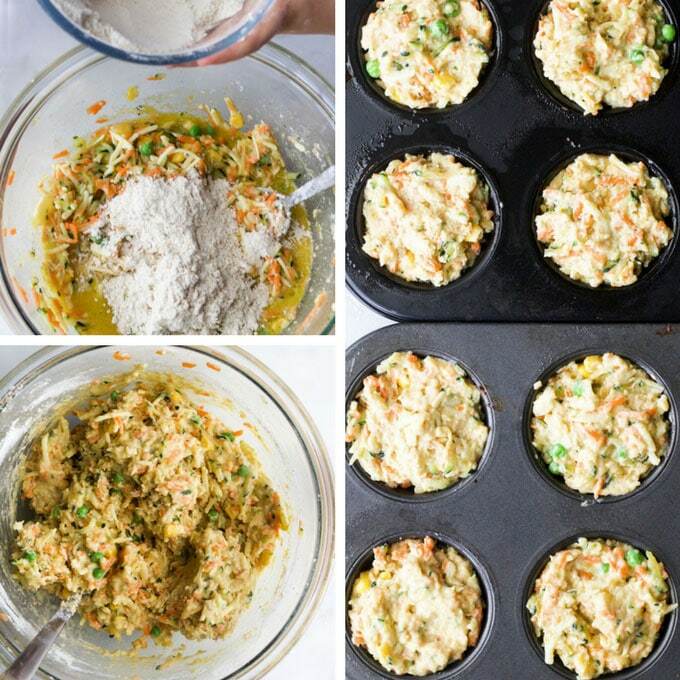 Savoury muffins packed with four different vegetables. Light and fluffy making them perfect for baby-led weaning, toddlers and the lunch box. Place the zucchini and carrots into a large mixing bowl along with the peas and sweetcorn. Add the cheese, milk, yogurt, olive oil and egg and stir until combined. I used a plain wholemeal flour, I am currently living in Australia and find their wholemeal flour whiter in colour and it appears more processed than the wholemeal flour I was used to in the UK. I can not guarantee what the results will be like with less processed wholemeal flour as I haven't tested although some people have commented that it produced a denser muffin. The recipe will also work well with plain / all purpose flour. Don't throw away the juice. Save it and add it to smoothies or pasta sauces etc. Don't be tempted to over stir the mixture. The mixture should be lumpy, thick and looking very messy. It should only take around 10 strokes with your wooden spoon. Every oven is different, so while you should still follow the bake time in this recipe, use a skewer to test your muffins a couple minutes before the end of the bake time. Your skewer will come out clean if they are ready. Please note: I have not added extra salt to this recipe as a lot of my readers are parents who do baby-led weaning. I used a strong cheddar and felt it gave enough flavour. However, reader feedback indicates that they lack in flavour and salt is needed. Adding chopped herbs is also an option. Nutritional facts are an ESTIMATE only, calculated using an online nutrition calculator. They should be used as a rough guide only. Have you tried these in a mini muffin tray? I Haven’t tried these in a mini muffin tray yet, sorry. I’m sure they would work well, I’d just check on them earlier. Hi Pooja, Sorry I have just seen this comment. I’m not sure why the muffin was dense, I’m presuming it was the flour. Did you make them in the mini muffin trays – perhaps they don’t work so well as a mini muffin? Hi. I just made these and they didn’t turn out. Is the problem a lack of levening agent (baking soda)? I also think some herbs are a must as there is very little flavor. So close though! Sorry Nadia, I have made these several times with just the baking powder and found they have worked well every time. Were you careful not to overmix the batter? Herbs, more cheese / a little salt will boost the flavour profile if you are looking for something stronger. I cooked minis today and they’re great! As I was making these, I noticed there was no salt or sugar in the recipe so I added a tsp of salt and 1/4 cup of applesauce. However, the muffins still turned out bland and dense. I would def add more salt/seasoning, more cheese and more applesauce or yogurt (I also used honey Greek yogurt) for flavor. I agree with this! Will try to give my daughter this for breakfast but even I didn’t want to finish one. Hi Anina, thanks for your feedback. I should perhaps edit the recipe to say to add salt/herbs to taste. Thanks for the receipe. I just baked them now & tasted one. So delicious. I added a pinch of salt & red capsicum, my favourite & mussins came out very well. I did 24 mini muffins Not densed. Thanks again for sharing. Can almond meal replace the wholemeal flour?? Hi Michelene, without trying I can’t really say how this would work with almond meal. I don’t think it will rise as much, you could try mixing it with buckwheat or rice flour if you are looking for a gluten free substitute. Let me know if you try it, I’d love to know if it works. Yes. I used 1 cup of almond flour and 1// cup whole wheat and 1/2 cup white flour. You can use all almond but it’s dense. I also added salt and seasoning. I keep experimenting. The batch I made tonight I also added a splash of Worcestershire sauce. Yum! I’m making these for a new mother of twins. These will be a great late night snack or grab a go bite. They freeze perfectly and 30 seconds at full power is all you need. Hi Michelle, Without experimenting myself I can’t say for sure but…. YOGHURT – On my first trial of these I didn’t use greek yoghurt and instead added more olive oil, they worked great (but I was looking to use less oil). So I know you can replace the yoghurt with another 1/4 cup of olive oil. MILK -I guess you could use a dairy free milk. CHEESE -The cheese is there for flavour so you can miss it out but they will be very bland tasting. You could add herbs to add more flavour. I know a lot of people use nutritional yeast for a cheese flavour but I have never used it before so can’t say how it would work for sure. EGG – I would try a chia egg in this. Hope this helps, again I can’t guarantee how it will turn out but would love to know if you try it. I think canned pumpkin might work in place of the yogurt. It doesn’t have a lot of flavor on it’s own. And plant/nut milk in place of milk. Chia or flax egg to replace egg. And leave out the cheese. Thanks for your dairy free tips Ruby, they sound great! Should I use one chia egg or 2? Jalapeno, corn, and cheese would be so awesome…. These would make perfect soup dippers. Hi am a vegetarian and i want to replace eggs. What do you suggest. Thanks. Hi Prabha, I’d try a chia egg. I can’t say for sure how it would work without trying it myself though. If you do try, I’d lobe to know how it works for you. I didn’t understand the vegetarian tag when it contains egg. So misleading. Hi Pradha, I’m not sure what you mean. I have called these Vegetable Savoury Muffins because they contain vegetables. I haven’t mentioned that they are vegetarian. However many vegetarians eat eggs so I’m not sure what the issue would be. You could try replacing the egg with a chia egg, I haven’t tried it in this recipe but I have used them before with great results. You can also try to replace eggs with applesauce (unsweetened) . I haven’t tried for this recipe, but i’ve tried in regular baked goods. Thanks for the recipe Amy, excited to try for my son entering K.
I think you mean vegan. Vegetarians still eat dairy and eggs, whereas vegans refrain from eating anything animal based. I’m a vegetarian and we eat dairy but not eggs as egg has a potential for life. Anyway… I just made these substituting eggs for chickpea tin water. They’re still in the oven so let’s see how they turn out! Hi Prabha – it is Vegans who don’t eat eggs (or any other animal products). Vegetarians eat eggs and dairy 🙂 So the tag is correct! This recipe looked delicious! Do you use frozen peas and corn frozen or thaw them first to get the water out? Hi Waka, Thank you! I used frozen corn and peas and I didn’t thaw them first. Could you maybe sub out some of the milk with the juice that you squeezed out of the vegetables? Does the milk make that big of a difference? Just wondering. Good idea, I’m def going to try that next time. I think it would work great. I tried it and used half milk and half of the juice and they turned out great. My daughter can not handle Greek yogurt at all. She’s okay with other dairy (weird) but I limit it all together. Do you have an idea of something to substitute with? I’d love to make these for us, without hurting her little tummy. Hi Briana, I have made these without the yoghurt and just added and extra 1/4 cup of olive oil instead. Someone has also mentioned pureed pumpkin as a replacement but I haven’t tried that so can’t confirm how they would turn out. Amy, these sound and look super yummy! We don’t have little ones anymore but I’m thinking I’ll make for my grandbaby or just for us as a soup dipper! Can’t wait to experiment with these and other veggies! I want know what that delicious looking dip is in your photo and get the recipe please! Thanks so much Karen, I hope you and your grandchild enjoys them! The dip is just my standard go to dip – Greek yogurt mixed with a little mayo and a good sprinkle of smoked paprika. Easy and my boys love it! Amy, try these with 1cuo cornmesl and 1cup flour of choice, 1/2 cup chopped onion. 1/2 cup cheddar cheese, i/2 cup chopped red bell pepper, 1/2 tsp. Italian seasoning, and ttwelve pickld jalapeno slics, and 1/2 cup of olive oil along with salt and 3tsp baking. Powder. Add enough milk, or even water to moisten very well, bake in muffin tins till browning. They are phenomenal hot with butter and soup! Sounds amazing! Why have I never thought to add jalapeno to muffins before. Delicious! I will be trying this recipe, it looks delicious. I have a silly question What is kitchen paper? Is it paper towels or a kitchen towel. I’m sad to say these really didn’t work out well. They’re dense. Never got fluffy. Also they desperately need salt or some seasoning. I checked the recipe to make sure I didn’t leave something out. They have very little flavor. I followed the recipe except I used 1 C white all purpose flour and 1 C whole wheat flour and I used mini muffin tins. Hi Lauren, Sorry you didn’t have success with the recipe. As you can see from my picture (with bite out) mine weren’t dense at all. Where are you from? I’m wondering if the flour is different. I have moved to Australia from the UK and the wholemeal flour here is whiter in colour and I’d say more processed than the wholemeal in the UK. Obviously it differs from country to country and therefore it may effect the recipe. *I will now add this detail to the note section of my recipe. Were you careful not to over mix the recipe, as detailed in the recipe notes? Over-mixing can effect the texture too. I have never tried this recipe in mini muffin trays – perhaps this altered the texture too, did you cook it for the same length of time? I deliberately don’t add salt to my recipes as most my audience are parents looking for food ideas for their babies and young toddlers. My kids are getting older now and I usually season my food more, I leave that up to the parents to decide. I did mention that you could add herbs / different vegetables to the muffin to suit taste. Your Australian wholemeal flour ( which I’m sure some of your readers would think is whole wheat flour via the name) would most likely be Graham Flour in North America of, which is unbleached AP flour that’s had some of the removed bran via processing, added back it to make it a bit more healthier. As for omitting salt. Salt plays a role in every baking formula. ( Think ratio’s) If you don’t want the baking project you undertake to turn out bland, ( herbs and spices don’t always do it ) even a pinch or so of good salt such as kosher or sea salt, not table salt, will heighten the flavour of your finished baked goods. There’s never the need to go overboard with salt. Something you and readers might find of interest. Flour facts from The Never ending cookbook by mum. Link to above.. Good reading for anyone unsure about Australian flours. Have you ever tried this with regular yogurt (plain, whole milk yogurt)? Hi Olivia, I haven’t sorry. I have tried it without the yoghurt, replacing it with an extra 1/4 cup of olive oil. These have been so useful for lunch boxes and BLW. I substituted the wm flour with 1 cup wm spelt and 1 cup white spelt flour and that works well too. I just tried this and it came out great!! I used whole wheat flour. The mixture looked very dense when all ingredients were added so I added a little bit of milk and oil. Also I used normal yoghurt not Greek yoghurt. Thanks for this. I will defiant try variations on this!!! Hi Jo, thanks for the feedback an info on your adaptions. Readers often like to know what works for others so this is good feedback. The mushroom and onion version sounds delicious. Thanks, Megan! So glad they turned out well for you. Thanks for taking the time to let me know, I appreciate it. These turned out so fluffy and delicious. I think next time I’m going to a bit more cheese and some salt. But otherwise I think my kids are really going to enjoy these. And they need more veggies in their lives lol! I want to use spinach instead of zucchini. What alterations should i make in the recipe and how much spinach do i use? Hi Saumya, without trying it I can’t say for sure but I would just replace the zucchini with 250g of spinach (trimmed and shredded). Hope they turn out for you! These were delicious! Light and fluffy since I didn’t overmix! Also I sprinkled a little salt on them when they were done baking. It helps to bring out the delicious flavors. If I want to bake with salt in them, do you think 1/2 tsp is enough? These turned out brilliantly! Looked just like the picture. I think reading all the tips and following the recipe to the letter helped. That said I did use plain flour (not a fan of whole meal because of the heaviness as said in other comments) but I swapped 1/4 cup for ground oats for a little extra nutrition. My 2 year old is happily munching one as I type… with ketchup for dipping of course. Thanks Sarah, so happy you had success with the recipe 🙂 I like the idea of adding ground oats into the mix! This is so great to know for other readers. I often get asked for egg replacement ideas but without trying them in the recipe I can never guarantee how they would work out. I’m delighted you enjoyed the recipe and that you could make it work for your diet! Your recipe looks great, I cant wait to try it! I sometimes use an egg substitute in my baking – I think its called ‘No Egg’. I am in NZ and got this from common sense organics, your Aus alternative store should hopefully stock it! Thanks for the recommendation, Emma. Good to know for when others ask! Hi Melissa, Fab! So happy that they were a success for you and that your little one loved them. Cream cheese sounds delicious on them! Just made them. Very easy and delicious. Used 1/2 whole meal flour and 1/2 plain flour just in case and worked fine. Definitely making it again! Thanks, Fabiana. So happy you liked them! Thanks for the feedback and info on what flour you used, it is useful feedback for other readers. Were not fans of frozen corn or peas here could I use fresh instead? Or would it not turn out correctly? I just made these (though slightly adapted) and they’re yummy! I halved the recipe because I only have a mini muffin tray and used half a courgette, half a leak, about a quarter of a broccoli and 1/4 cup of peas. I made them for a picnic tomorrow for me and my son and I think he’s going to love them! Hi Anya, Thanks for the feedback – hope your son loved his picnic! I am on Weight Watchers, have no little ones at home. I’m adapting it by using fat free milk, 1/2 regular cheese, the other half 50% reduced fat Cabot sharp cheddar, 2 Tbls EVOO vs 1/4 cp plus 2 Tbls reduced fat butter/canola blend, throwing in 1/4 cp fat free cheddar. Will let you know how they turn out. Probably add garluc powder, dash salt, Mrs Dash and dash of pepper! Hi Sherry, hope you got a good result! I made these with half white all purpose flour and half whole wheat flour. I didn’t have any zucchini on hand, so I added a bit more carrot and some red bell pepper, along with the frozen sweet peas and corn. I will admit that they are a tad bland without seasoning for my liking. BUT, my 14 month old LOVES them! Sometimes we add a bit of butter on them for him (he’s a preemie and small for his age so they say a bit of extra fat is good for him.) But we don’t do it all the time though. Sometimes we just cut one up and give it to him plain with a side of berries or fruit. He absolutely loves these muffins. And they freeze well! I’m currently making my second batch since we ran out of the first batch. Thank you for this recipe. It’s a great way to get vegetables into our little guy. Hi Lynn, Brilliant! So happy your 14 month loves these. Thanks for giving feedback, it makes my day when I hear people are enjoying my recipes. I made this muffings today. They look and taste amazing. I didn’t have any yogurt and added some Philadelphia cheese. I was unsure about the texture and cooked them in two batches incase the first batch was to dry but not it came out perfect. Hi Ana, thanks for your feedback. Loving the sound of Philadelphia in the muffins!Yum! These were delightful! Made with plain flour and doubled the cheese content – absolutely devine in flavour. Texture was spot on too, moist and fluffy (I folded the flour in as advised which no doubt helped keep it light). Thank you. I have just made these and they smell so yummy. I get what people say about lacking flavour but I was kind of looking for that as I have a toddler who has gone off veg and was looking for something to see if we can change this. I am in the UK so I used self raising flour. They’re a little sticky in the middle and took a long time to cook! Considering I don’t bake I am quite happy with them. Let’s see if the little one agrees when she wakes up! Hi Stefanie, thanks for your feedback – how did they go with your little girl? Fingers crossed she liked them! Doing these for a school project where we are supposed to make a difference in our community, going to serve them to homeless people. Thanks for making this recipe! I love this! Such a lovely thing to do, hope they go down well! Hi there, thanks for posting this will try this weekend. Once defrosted do they need to be warmed up or can be eaten cold? As sending with my son to daycare. Hi Renee, My two are happy to eat them cold. 🙂 Hope you enjoy them! I baked these for my baby last night and they turned out beautifully! I used whole wheat flour and had no issues with density. I didn’t take the time to squeeze out all the liquid; rather I added 2 tbsp chia to soak it all up. My baby loved them this morning! hey….in this we need to squeeze out apple juice ? Hi Amy. Tried this last night. It was just yumm. I prepared using whole wheat flour. Thanks for sharing healthy recipes. Neither our one-year old nor we are big fans of the muffins. They taste rather bland. We think this recipe will appeal more if it makes use of some spices and aromatics to enhance the flavor. For instance by adding a dash black pepper and some sautéed shallots/ green onions and garlic, the muffins will have a some savoury & sweet notes, while still keeping them very healthy. These turned out well. I swapped the yoghurt for chutney to give them more flavour. I also didn’t need to squeeze any juice from the veggies as they seemed pretty dry. Had to add a little more milk, mostly because my toddler ‘helped’ with the flour haha. Thanks for the recipe. I just made these and they are delicious. I added in 1/4 of the vegetable juice from the carrot and zuccini and 1/4 milk in there, instead of 1/2 cups of milk and they came out amazing. I used all purpose flour and no baking soda (the all purpose flour in my country already contains baking powder) and they were soft and fluffy. I am definitely making these again. Do not try theese, they taste very very bad and look disgusting my kids hated them. I was scared to give it to them. EWWWWWWWWWWWWWWWWWWWWWW. Hi Jessica, I’m sorry you didn’t have much success with the recipe. What was wrong, the texture or flavour? Maybe it is just a quick fix, if the flavour was a little bland then try adding some more cheese or herbs. If the texture was wrong, perhaps it is the flour. Maybe try plain flour if that is what you are used to more? Did your kids try them? I’m a little confused because you said you were scared to let them try the muffins but you also said they hated them…? Maybe they could sense that you were scared to let them try them. If I was offered something that someone obviously wasn’t keen on then I’d be wary and probably not like it. Kids pick up on these things! Hi Sonja, My youngest did baby led weaning and I would have happily given these to him at 8 months. He was only offered real food and wasn’t used to swallowing purees. It all depends on how much experience your baby has had with finger foods but there is nothing in the recipe that a baby can’t eat. You may wish to reduce the cheese to lower the sodium content but if you do that I’d definitely add some more spices/herbs to give them more flavour. Hi, I just loved this recipe coz my 1 and half-year old son doesn’t eat veggies. He loves bread and cheese and this is a clever way of incorporating his veggies as a snak. However, I have had a bit of trouble with the baking. I tried this twice but in a loaf pan. Kept it for 10 mins longer but it hadn’t cooked completely in the center. I thought it was because of the cheese but to be on the safer side, I sliced it and baked it on the tray for another 10 mins. How long do you think I would need in a loaf pan? Thanks Annie. Yes, that should work well. Where are you based? Please read my notes on the flour. You may wish to mix the wholemeal with plain flour. Thanks Amy, I’m based in Sydney, but originally from UK where I’d be using self raising flour more often for muffins and cakes 🙂 I’ve just read your flour notes, really useful thank you! Is Plain Wholemeal Flour the same as Whole grain or whole wheat flour? Here the US, i haven’t really seen wholemeal flour. Hi Amanda, sorry for the delay. Yes, I think it is the same as white whole wheat flour. You can also use all-purpose or a mix of all-purpose and whole wheat. I just took these out of the oven and they are light and fluffy BUT had way too much flour so I added an extra egg and a little more yoghurt. I also added garlic and dried Italian seasonings as my toddler hates bland food! They smell great! I substituted chopped spinach for the peas and corn, and my 10 month old loved them. They did end up quite dense, as other commenters have mentioned, but were tasty all the same. They don’t make much mess and would be great for a picnic. This is a fabulous recipe. Ibaked in mini muffin tins and took to work for a.birthday morning tea. It made 30 tasty little bites and I added a dish of butter for those that wanted a little extra. I didn’t have yoghurt so added sour cream. They came out super soggy and underbaked…had to throw away whole batch. I was so excited to give them a try but turned out a complete fail. Is there something I did wrong? I followed the recipe to the T with one exception I subbed the wholemeal flour for AP flour. Thats it. I don’t know what went wrong? Hi Aleksandra, I am sorry you didn’t have much success with the recipe. To be honest I have had very mixed reviews with this recipe. Although I have had a lot of positive feedback I have also had comments from those that didn’t have success with the recipe. Some saying that they are too dry and others saying they were too stodgy. I am not sure what could have gone wrong,(except from the comments I mention in the recipe notes). Did you squeeze the liquid out of the vegetables? I’m braving the recipe with self raising as it’s all I have. Hi Tara! Glad you found the notes, hope you liked them?! I made these for my 1,5 year old today. Added a sprinkle or 2 of mixed herbs and a dash of salt. I just made these for me and my nine-month-old son and they turned out great! If my son wasn’t eating with me I would probably ad some salt, but apart from that taste and consistency are very nice. I used plain spelt flour and due to not having corn doubled the amount of peas, worked great anyways. I will make them again for sure! Thank you for the wonderful recipe. Can you sbusitute the veg fir greens. I am doing keto and cannot have corn or other high carb veg. Also would almond flour work instead? Yes, you can switch the veggies. I’ve never tried making these with almond flour so can’t say how it would work. Thanks for sharing your creation. I made these using a combination of 1 cup Cauliflower flour, 3/4 cup almond flour and 1/4 cup coconut flour. Threw carrots, zucchini, broccoli, cauliflower, kale, chard, baked sweet potato, mushrooms, corn, cilantro and parsley in the food processor, and added some cooked millet in for crunch. Clean out the fridge muffins…Delish! Hi Ann, thanks for your feedback and info on your alterations. It is always good to know what variations work well! Love the name “clean out the fridge muffins”. My Mum used to always make “clean out the fridge soup” and we loved it as kids! These were a hit with all my boys, including my husband. Tasty and easy. Thanks for the storage tips too. Just finished baking these. My LO is dairy free and I am gluten free so I substituted for gf flour and added 1/4 cup ground flax. I used almond milk and coconut yogurt. No cheese and a little bit of basil and garlic powder (a pinch). I also used a frozen veg mix with carrot, peas, corn and beans and added some extra fresh grated carrot. Rinsed and dried them then chopped them up finer in the food processor. Sprinkled a bit of salt on top. I tried not to mix much, but not sure how well I did on that. Final verdict … Fluffy and moist! But does need a bit more flavour. I will mix in salt and more seasoning next time. Overall I really like them! The salt sprinkled on top helps but I think mixed in will be better. Maybe a bit more veg too, which will add extra flavour. I think this recipe will be a good base for a fruit and veg mix as well. Hi April, thank you so much for your detailed feedback. I often get messages from people who have children that are dairy free / gluten free so it is so useful to know what has worked well for other readers so that I can give suggestions. Thanks again for taking the time to rate and give feedback. Just wanted to say I tried theme and love them. I tried with regular white flour and whole wheat. I also played with the recipe. I use the President Choice frozen corn with jalapeno, added chili powder and Kirkland crumbled bacon. Delicious. Next time will try other cheeses. Thanks for the great recipe. I used leftover butternut pumpkin finely diced in my food processor – excellent! I subbed applesauce for oil and wasn’t disappointed 🙂 Thank you! Hi Amy, I tried these and they were a great snack for my little girl. I can’t wait to try out some of your other recipes. Thanks! I’m so glad I found this recipe and tried them – they were fab! I used half self-raising flour and half rice flour, added some salt, pepper, mixed dried herbs & a little bit of liquid from a jar of jalapenos. . The texture was lovely – really light and fluffy. Having been poorly over the last couple of days, my little one managed almost a whole one – yay! I’m thinking of trying caramalised onion and goats’ cheese next time. And maybe some with feta and some kind of vegetables (spinach, pepper?). Got to get the cheese in, right!? Thank you for sharing – I’m now going to go browse some more of your recipes! Thank you! So happy you enjoyed them and I am loving the sound of your variations….yes cheese is always good! After adding black pepper, green onion, and a dash of red chili flakes, these were perfect for breakfast! I cut one of these in half, stuck an egg in the middle and had a nice quick breakfast sandwich ! :-) Thanks for the recipe! Thanks Kris! I’m loving the sound of an egg in the middle of these – delish! I would like to know how much to fill up the muffin pan with batter. Hi Nayia, the recipe will fill 12 muffin sections. I filled pretty much to the top (there is a picture above.) Hope this helps. Thanks for the recipe,they’re a big hit for breakfasts and snacks! I used 1/2 cup mayo, 3/4 cup plain coconut yoghurt, 1/4 cup nutritional yeast, and 1/4 cup unsweetened almond milk instead of the cheese, greek yoghurt, and milk. I also added a tsp of veggie stock powder, 1/2 tsp garlic powder, and a tsp of dried oregano for flavour. So yummy! Hi Zrinka, I have only tried Greek yoghurt in this recipe but I think regular plain yoghurt would work well. I just made these hoping it would be a “somewhat” healthy way for me to get my 5, 3 and 2 yr old to eat some more veggies. They did like them and I am not a fan either. I added just a touch of salt to the flour mix before adding the dry to the wet. I don’t know how you got the dry to stir in enough with just 10 strokes.. i tired not to mix too much like suggested but ended up with flour on the top of a lot of my muffins and they came out tasteless. I am not a person that needs heavy salt in food, I appreciate the natural flavour of vegetables, but you had no salt on you ingredients list. Salt enhances flavour. I even triple checked to make sure I didn’t just miss that on the list. But no, no salt… or pepper. It’s a shame because now we have to smother them in ketchup (for the boys) and marinara sauce for me and my husband to have any flavour. Hi G, sorry these didn’t work out for you. I didn’t add salt as a lot of parents who do baby-led weaning use my recipes. Perhaps I should mention this though and suggest adding salt if making for older kids. Herbs are another great way to add flavour. I wonder if your cheese wasn’t as strong as mine, I found that it provided flavour but I do buy strong cheddar cheese, a mild cheese won’t have the same flavour profile. I made these today. I used one cup of SR flour, and one cup of Plain flour. I added salt, dried basil, a tablespoon of sugar, and a generous teaspoon of curry powder. I used cheddar cheese and parmesan. I didn’t add yoghurt, only because I didn’t have any, nor the bicarb soda. I scooped mixture in to muffin tins and it turned out pretty good. I served it with a bit of butter on top. My 3 yr old loved it. Hi there, these look great but is there a substitute for the Greek yogurt? My son has a cows milk protien allergy, so we use formula in place of milk, but also can’t use greek yoghurt? Any suggestions? I think there is a coconut yoghurt (have not tried yet), that may work? Hi Sam, you can replace it with olive oil, I haven’t tried coconut yoghurt in this recipe so can’t say how it would turn out. Yummo, I used spelt, an exact exchange, added 2 generous pinches of salt, 50g Parmesan and 70g cheddar, and a generous sprinkle of mixed herbs. I also used my red and green capsicum that needed using up instead of corn. I made this today and it was perfect! My 9-month old loved it! This will be my go-to veggie muffin recipe. Thank you for sharing! I just made these and I think they are delicious and they turned out perfectly. I used regular flour as that’s what I had in the cupboard. I added 1/2 teaspoon of Keens Curry powder and about 1/4 cup (maybe less) of grated Parmesan (in addition to the other cheese). I used red capsicum, chopped baby spinach, corn and carrot as my veggies. Haven’t tried them on Miss One yet, but if she doesn’t eat them, I’m more than happy too (as is hubby)! Has anyone tried to adapt this to suit a dairy and egg free diet? My toddler has intolerances to these and I’m desperate to find a muffin recipe where it include vegetables because he’s so picky! Thanks! I haven’t, but lately I have had so many requests for egg and dairy free recipes. I plan to develop more in the new year and a veggie muffin is on my list. Sorry I can’t be of more help just now. Hi Amy. Love this recipe but I’ve never really understood the cup measurement thing – what would the grams be for the ingredients that don’t have the grams equivalent next to them? Thanks in advance! Hi Kate, sorry about that – I usually try to add the cup and metric measurements. I’m not sure why I only did half the recipe, I will need to update that. Use 125ml of milk, 60g of yoghurt and 60ml of olive oil. I really like the idea of these. I made them this evening but I had to use almond milk and vegan egg substitute and vegan shredded cheese because my son is allergic to dairy and eggs. I did add 1 tsp of salt and some thyme for flavor. I cooked it 35 minutes as it was still raw in the middle at 25 minutes. Unfortunately, these never rose. They are still in the same shape they were in when I plopped them in by the spoonful. I think they taste good but I would have liked them to rise a little. Any tips that might work next time? I made sure not to over mix. Hi Alexandria, What did you use as the egg substitute? I’m presuming that this may have been the issue, perhaps experiment with other egg substitutes? You can replace the Greek yoghurt with olive oil, I have tried that and it worked well. Unfortunately, I haven’t experimented with different egg substitute so can’t give you any more help, sorry. I am so happy with this recipe! 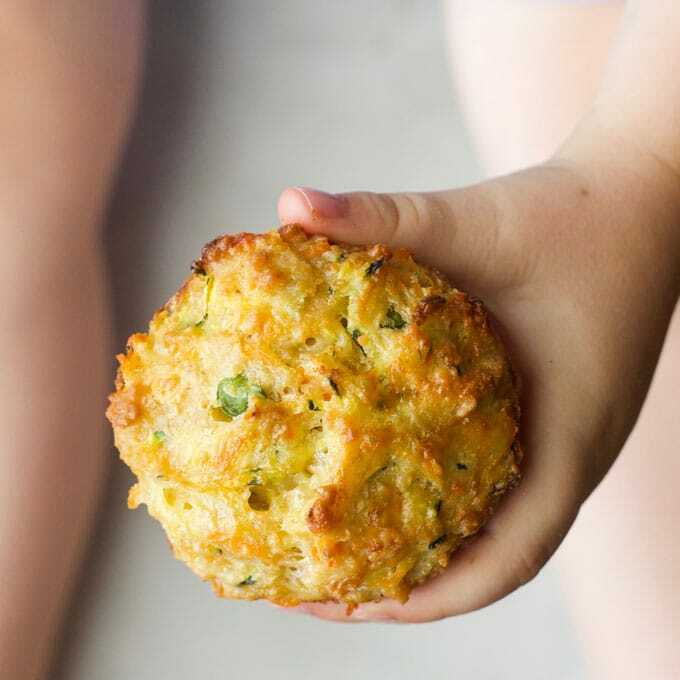 My daughter has an egg allergy and I have tried a lot of savory muffin recipes over the years and these ones worked the best so far. I substituted the egg with egg replacer & also only had natural yoghurt in the fridge instead of Greek. All of my kids were happy to eat them and loved how plain and light they tasted. Thank you! I tried these, but changed a few things, instead of peas and corn, I added bell pepper and cooked down mushroom and spring Orbison before adding to the misture. I also used just a bit of mozzarella grated cheese. As comments had said thy found it bland or dense, I added fresh chives finely chopped and nutmeg. I also baked them with one part plain flour one part wholesale spelt flour. Turned out great. Thanks for the recipes. You have made my life so much easier, with a very fussy baby that won’t eat anything they can squish in their hand! Just made these now for my eight month old – she loved them. There are a lot of comments here about them being bland but I think people just need to use common sense when it comes to seasoning and also, bland is fine for kids! They don’t need much salt anyway. I have made these several times over the last couple of years and they always work out well for me, following the recipe to the letter. Never dense, nor tasteless. I’ve made them in several different countries, with different humidity levels, ovens and flour variations (including the mentioned courser UK whole meal). I make them for me (an adult) and I find them so moreish I struggle not to eat them all as they cool down. Exactly what I wanted from a vegetable muffin recipe – a tasty snack without sugar that has good nutritional value. I see these comments and I can never understand them and felt I had to say something to deter others from modifying the recipe unnecessarily. Occasionally I add some fresh parsley if I have some extra to use. I find the recipe usually makes more than 12, so I may be filling the cups slightly less than intended. I tried a modified version of this: I don’t put peas and corn. I have made it with and without cheese. I don’t add any salt. I add oreganos. I don’t miss the salt when I add oreganos. The cheese makes it better but in my view less healthy. Overall it’s a great recipe. Squeezing the carrot and zucchini is really important! Thank you for the tip! Yum!! Thank you. I love this recipe. This is a wholemeal flour recipe that works. I didn’t add anything and found them very tasty. I love this recipe, so easy to make and such a good lazy lunch to get out the freezer for my little one. I added some cooked and chopped up cauliflower and broccoli and as I didn’t have any cheddar cheese I just used a little grated Parmesan cheese instead. I did this as directed, only adding some fresh basil. While I thought they were pretty bland, my 11 month old has been gobbling them up! Great healthy way to get veggies in and super transportable for when we’re on the road.